Well, well, well.. If it isn't Ms Tami Roman - the actress and Reality TV Star for VH1's 'Basketball Wives' shows off her amaaaazing body in this new weight loss commerical for NV. Tami Roman did not exactly have "the body" when she appeared on our screens in 2010 as a new cast member and friend to Shaunie O'Neal on season 2 of Basketball Wives. 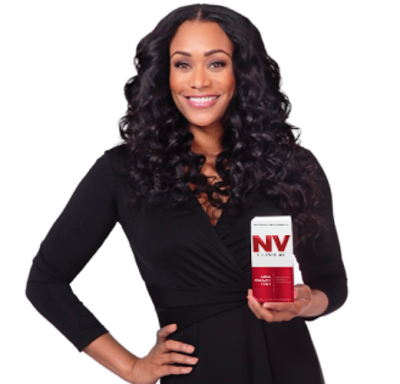 Roman has lost a tremendous amount of weight and her body is looking just great, but she didn't do it alone she done it with the help of NV Clinical - the new campaign that she is the face of in this new commercial. Tami Roman is set to appear on our TV Screens again this February for the return of Basketball Wives season 5 (which is still currently being filmed) and Tami says that there's going to be a "change". Gurl, I'll believe it when I see it! Tami Roman is also coming out with a low calorie cookbook with celebrity chef coming soon. Watch the commercial below.